FinishTime, South Africa’s fastest growing timing company with 180 events in the year nationwide, have joined forces with Spectrum Sports Timing (SST) to extend their footprint to races around the country. SST have for a number of years been the official results company for events such as the Joburg2C, Sani2C and Berg&Bush amongst others. With this integration into FinishTime, competitors will now be able to see their results “Live” on the FinishTime website, in addition to receiving a personalized text message confirming time and final position. This encourages competitors to post their final results to social media for “bragging rights”. The integration of SST into FinishTime means that South Africa’s leading timing company will now be even more prominent in the Gauteng Region, timing more triathlons, road, cycling and mountain bike races. Entrants will also be able to see their splits during the race in their final result. In line the with the FinishTime culture, we are pleased to announce that Gertjie and Retha Harmse (formerly SST) will take on the roles of Technical and Managing Directors of FinishTime Gauteng, respectively. 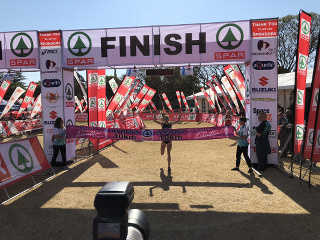 FinishTime Managing Director, Trish Meyler Eldridge “says “With more and more races wanting to make use of FinishTime in the Gauteng and Gauteng North region, it made sense for us to come to an agreement with Gertjie and Retha and we are looking forward to be a long working relationship. It means that we now have a permanent crew in that region which makes facilitation of results quicker and more efficient”. The decision to join forces is undeniably a win for all involved, the athletes, the regions and the industry at large.